Did you know that you have the ability to impact how you learn based on how you think you learn? Science tells us that people may have either a growth mindset or a fixed mindset. What does that mean for you? Check out this infographic to learn more or watch some (or all) of the videos. The image above was designed by me. Please give credit to Beth Dichter if you choose to use it. 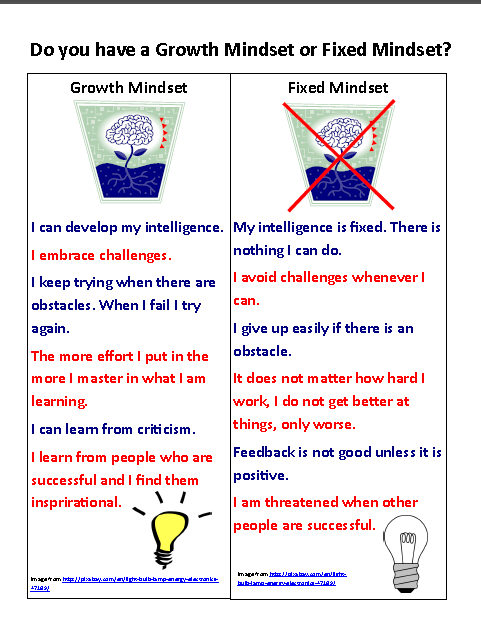 What kind of mindset do you have, a growth mindset or a fixed mindset? What might you do to get a stronger growth mindset? You know how to grow your body, but do you know how to grow your mind? Watch the video to learn more. Can you learn anything? According to this video the answer is yes! Learn more by watching this video. This video is a great introduction to learn what a growth mindset is and what a fixed mindset is. Remember, you can change your mindset with effort and time. This video looks at sports and talent but if you watch and listen you will also see and hear information on mindset. Sesame Street characters join in with Janelle Monae and students will learn about the power of the three letter word YET. TED-Ed has some great videos that look at mindset. In Overcoming Obstacles a young man talks about his freshman year at high school, and "explains why obstacles can provide an opportunity to both inspire others and develop character. FYI - TED-Ed has great videos that are created for students. If there is a subject you are interested in learning more about you might check them out to see what you can find. Changing Our Mindset is a visual that looks at 7 areas where your mind can make a difference, comparing what happens if you have a growth mindset or a fixed mindset. The areas are: Desire, Evaluation of Situations, Dealing with Setbacks, Challenges, Effort, Criticism, Success of Others, Result. Famous Failures - Did you know that Albert Einstein did not speak until he was 4 years old? Michael Jordan was cut from his high school basketball team. Why? He lacked the skills. Find out about 13 more people in this infographic that says "If you've never failed, you've never tried anything new." Khan Academy has a website You Can Learn Anything. You will find 4 posters on this website that you might want to print out and share. Teachers/Parents, you may find the resources below helpful for your learning. The Growth Mindset: The Important Thing NOT Taught Under The Common Core at http://blog.mimio.com/the-growth-mindset. This article explores the four Academic Mindsets: Growth, Self-Efficacy, Sense of Belonging and Relevance. There is a great visual that you may want to share with students and parents. Information on the Stanford Project for Education Research that Scales (also known as PERTS). Four Belief Statements Underlying Student Performance at http://gettingsmart.com/2014/07/david-dockterman-4-belief-statements-underlying-student-performance/. Growth vs Fixed Mindset at https://www.youtube.com/watch?v=o8JycfeoVzg. Video to share with students. Getting into the Right Mindset for Learning at http://mgleeson.edublogs.org/2013/04/07/getting-into-the-right-mindset-for-better-learning/. Excellent infographic on mindset with discussion and movie clip. Carol Dweck is an expert on growth mindset. If you want to learn more about growth mindset you might want to check out some articles at Mind/Shift that look at her work.